Re:artiste have recently opened the “Show Your World” 2015 annual art competition, calling artists around the world to participate. This competition is about how you see your world. About humanity and nature, both urban and remote. An interpretation of our expressive world through the eyes of you. 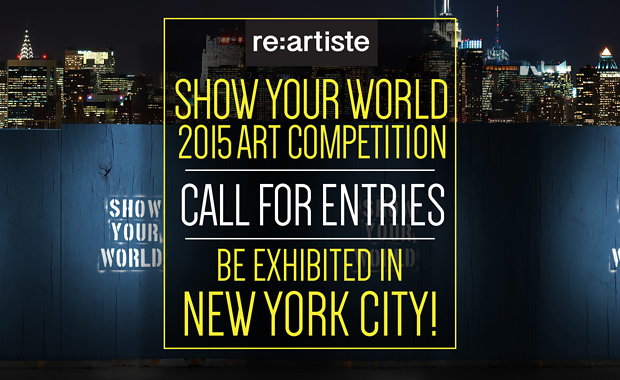 Open to artists from around the globe, the “Show Your World” 2015 art competition gives its participants an opportunity to gain recognition and have their work exhibited in New York City. The winner will be invited to attend The Residency hosted by re:artiste at no cost for an entire week. The winner, as well as twenty finalists, will have a chance to display original work at the “Show Your World” exhibition in New York City in Fall 2015. All other participants will be featured on a digital display. The winners will be announced on the re:artiste website by 30th August 2015. The winner and finalists will be personally notified by email. The entry fee is $35 for up to five images.